Posted on February 13, 2011 by Deborah B. The Kirsch Family of LaVergne had major damage to their home from a early morning fire in Stones River Cove subdivision. The family has lost many of their household and cherished items. Please keep Trish Kirsch and son Zach in your thoughts or prayers. La Vergne fire fighters respond to fire in Stones River Cove subdivision. Severe fire, smoke and water damage to home. La Vergne firefighters were called to the scene of a house fire at 600 Ronnie Erwin Lane in the Stones River Cove subdivision on Sunday at 12:38 a.m. The fire had burned long enough to destroy the master suite and to cause extensive smoke damage throughout the rest of the home. 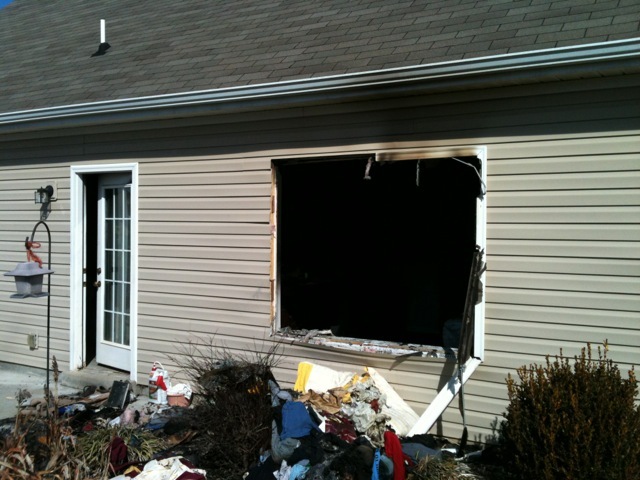 La Vergne Fire Marshall Victor Woods said the fire was caused by a malfunctioning hair dryer. Trish Kirsch and her son Zach, a senior at La Vergne High School, lost many cherished belongings in the blaze, including their cat Squirt. Long active in the La Vergne community, the Kirsch family has volunteered extensively at the city’s ball park. In addition, Zach is a volunteer with the emergency relief group Box 100, the Rutherford County Volunteer Fire Department, and Almaville Fire &amp; Rescue Department.